Bhikkhuni Kattanuta ordained in Bodhgaya, India in 1998. 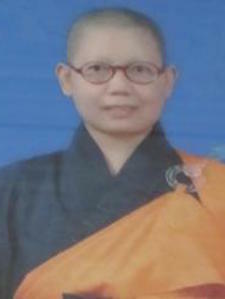 She ordained at an international higher ordination ceremony, and is a pioneering Mahayana Bhiksuni in Thailand. After her ordination she lived quietly, traveled abroad to many countries to study with international masters, and returned to Thailand to pursue a master’s degree in Buddhist Studies. Against the stream in a university of male monastics, she pursued her degree until she could go no further. Then she integrated her life skills as a former-government school teacher, and decided to offer a complete circle of love to young village children. Her village is in an industrial area of Ayutthaya Province, and her compassion radiates outwards and draws to her girls and boys in need of food, clothing and teachings which she freely offers to them. Her social work efforts are well-known in Thailand. She dons Mahayana robes and understands very deeply both Mahayana and Theravada Buddhism. She is patient, wise, compassionate and an excellent role model.